Phi Phi Island entertainment will thrill you to the core. From its sandy beaches, incredible recreational possibilities and hopping nightlife, Phi Phi Island is the entertainment beach capital of Thailand. Phi Phi Island entertainment can be best experienced in the water - whether on a boat, kayak or canoe, or swimming, snorkeling or diving, Phi Phi Island entertainment has it all. At the end of the day, many visitors will want to immerse themselves in the social scene and nightlife of Phi Phi Island entertainment bars. Besides great Phi Phi restaurants and recreational activities on Phi Phi, the entertainment includes hot hangouts that offer music and dancing. You can even catch the occasional boxing match or relax in front of Satellite TV for a football game at one of the many Phi Phi Island entertainment bars. Phi Phi Island entertainment is meant to be enjoyed outdoors. A lot of fun can be had on the beaches of Phi Phi, in the water, on boats or just strolling around the town, shopping for souvenirs. Learning to dive and exploring the underwater tropics are a few of the favorite Phi Phi Island entertainment activities. It is not uncommon to see leopard sharks and unique cave fish while diving in the aquamarine waters of Phi Phi Don and Phi Phi Ley. Discovering exotic marine life and taking in the beauty of the mountains and native birds is one of the best ways to experience Phi Phi Island entertainment. 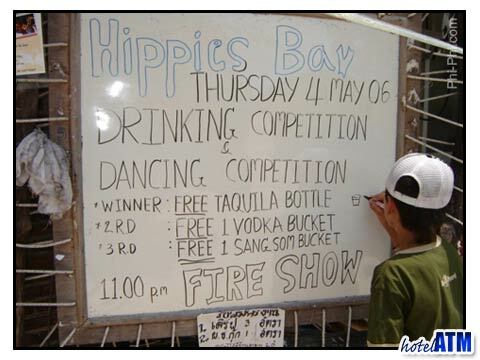 Various Phi Phi Island entertainment companies and businesses offer guided tours around Phi Phi and its neighboring Islands, making Phi Phi Island entertainment easy and fun. Of all the Phi Phi Island entertainment bars, Phi Phi Reggae Bar is the perfect hang-out for people who want to unwind after engaging in a long day of Phi Phi Island entertainment like sunbathing, kayaking or shopping. At Phi Phi Reggae Bar, you can grab a drink, listen to music and dance the night away. Enjoy recalling the day's adventures and share your Phi Phi Island entertainment experiences with other tourists and friends. Phi Phi Island entertainment bars are the perfect end to a busy day. 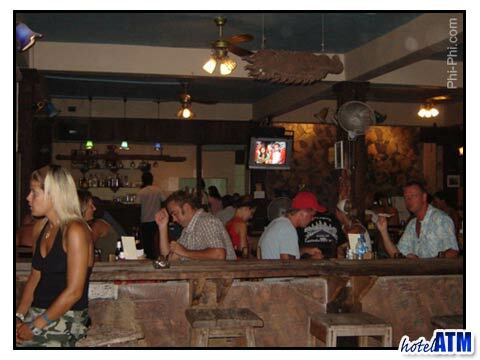 While staying on the Island, you will most likely stop in to many Phi Phi Island entertainment bars, though if you're like most visitors, Phi Phi Reggae bar will certainly become your favorite! Slinky Beach Bar has great dancing down on the Loh Dalum Beach near Phi Phi Twin Palm. The Dojo Bar is near the Reggae bar and plays superb early evening music to get the heart pumping and it is also one of the main organizers of the Phi Phi Party Crew. The boating event combines music, the sea, boats and the magic of the Phi Phi Ley scenery.